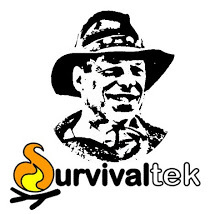 Years ago I was invited to demonstrate primitive and survival skills at a Boy Scout Day event. I had invited a friend to join me who manned my area which gave me the opportunity to break away and visit the other Vendor and Scout troop displays. One of them stood out from the others because the Scouts had built a raised platform using bamboo sticks. It was about four feet off of the ground and was very sturdy. Their design had originated out of Vietnam where the fields and paddies were abundant with snakes, rats, and other critters and the platform allowed them to sleep at night with a margin of safety and comfort, not to mention it kept them off of the wet ground. 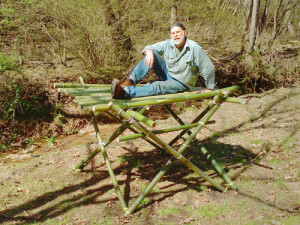 I live in the Northwest region of North Carolina where there are numerous groves of bamboo that have been referred to as a “primitive hardware store”. I feel truly blessed for this resource although some folks who are not into primitive skills and crafts find them annoying. The other day I was traveling down a local road where there was a pile of bamboo poles left for disposal. I stopped by the property and asked the owner for permission to take some whereupon the owner gladly offered them and more to me. I made several trips to transport the poles home, the longest pole was thirty-seven feet! I began to cut six foot lengths of equal circumference. I needed twelve to construct the basic framework. I cut six additional poles and split them lengthwise to lay out on the top of the frame to complete the platform. I bought two fifty-foot tie-down cordage bundles for lashing. I had to supplement them with more cordage to tie the bottom legs and an additional step (for Grandkids and neighbor’s children). I was conservative on cordage for lashing but a more permanent structure should have twice as much… but for now it works and I will be sleeping on it tonight! 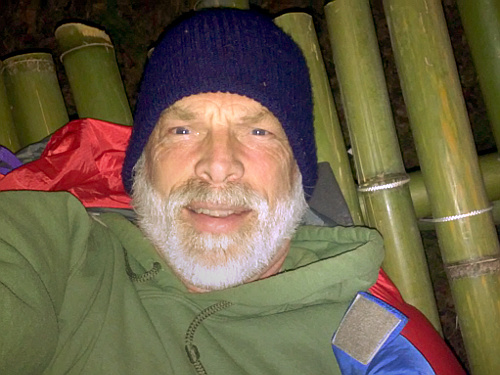 It was a cold night (36°) but I stayed warm in my down sleeping bag nestled inside a bivy bag. In lieu of traditional foliage as padding, I used a ground mat on top to sleep on. A pillow would have been nice! There was a full moon last night so I never used a flashlight. The flat/hard platform reminded me why I have switched to hammocking. In the end it was a great experience sleeping on a very solid bushcraft structure. This entry was tagged Bamboo, Bushcraft, Shelter. Bookmark the permalink.